Peace Pedalers launches their latest project "Spokes for Hope" delivering thousands of treatments of the malaria medication Coartem to remote African villages in 16 countries. Peace Pedalers, an around the world tandem bicycle expedition promoting peace, cultural awareness and random acts of kindness, today announced they have received a donation of 1,500 treatments of the malaria medication Coartem from Novartis. Coartem has a 95% cure rate and Peace Pedalers will carry the treatments on the remaining 16 countries of the Africa portion of the expedition from Mozambique to Morocco. Malaria kills over 1 million people in Africa a year and many of them are under the age of five. 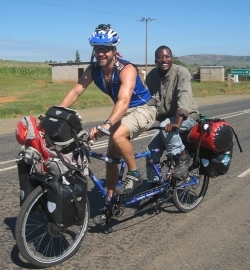 Peace Pedalers, with one full time expedition rider Jamie Bianchini, will enter Mozambique in late November and begin riding north through hundreds of remote villages where adequate medical services and NGO aid is often not available. "Our expedition has always been about giving and practicing random acts of kindness. Most of our projects have results that are hard to measure. But this new project is the most meaningful ever as I can actually save lives," reports expedition leader Jamie Bianchini. Peace Pedalers is an 80-country around the world tandem bicycle expedition run by Jamie Bianchini. Jamie rides on the front seat of the tandem bike and leaves the rear seat open to invite total strangers to join for portions of the expedition. They launched in Japan in 2002 and have traveled through 21 countries in Asia and Oceania. Peace Pedalers manages a website, www.peacepedalers.org, and is filming the expedition with the support of Panasonic to deliver various forms of cultural education and awareness media. They also visit schools, orphanages, donate bicycles to help alleviate poverty and deliver grassroots aid to those in need along the route of the expedition.